A new study from the Rand Corporation links the introduction of abuse-resistant Oxycontin in 2010 to the rise in heroin overdose deaths, Bolivia and Colombia take different approaches to coca, a Georgian political party office gets raided, and more. New Mexico Legalization Bill Filed. State Rep. Bill McCamley (D-Las Cruces) has filed House Bill 89, the Cannabis Revenue and Freedom Act. It would allow the possession of up to two ounces by adults at home and one ounce outside the household, the cultivation of up to six plants (or 12 per household) and the possession of a harvest up to eight ounces. The measure would revamp the state's existing medical marijuana system and allow for marijuana sales beginning in 2019. Georgia House Forms Medical Marijuana Study Committee. House Speaker David Ralson (R-Blue Ridge) announced Wednesday that a medical marijuana study committee had been formed with Rep. Allen Peake (R-Macon) as its chair. Peake is the author of the state's current limited medical marijuana law and has already announced plans for legislation this year. RAND: Introduction of Abuse-Deterrent Oxycontin Led to Rise in Heroin Overdose Deaths. In a new working paper released this week, the RAND Corporation looked at supply-side attempts to limit access to opioids and found unintended consequences. Focusing on the 2010 introduction of abuse-resistant Oxycontin, the RAND analysts found "large differential increases in heroin deaths immediately after reformulation in states with the highest initial rates of OxyContin misuse" and concluded that "a substantial share of the dramatic increase in heroin deaths since 2010 can be attributed to the reformulation of OxyContin." North Dakota Civil Asset Forfeiture Reform Bill Filed. Eight state legislators jointly filed House Bill 1170 last week. The bill would prohibit the seizure of property without a criminal conviction in most cases. The measure would also require that most proceeds from forfeitures go into the state's general fund; currently, law enforcement agencies can keep up to 100% of the proceeds. The bill would also ban passing busts off to the feds in a bid to evade state restrictions. Bolivia Government Files Bill to Expand Coca Production. The bill would expand legal coca production from 30,000 acres to 50,000 acres. But not all coca growers are happy because some regions are getting more expansion than others. Colombia Starts Spraying Glyphosate on Coca Crops Again. Colombia recommenced the controversial program on January 2, but this time, it's not using airplanes. Instead, the spraying is being conducted by hand. The aerial spraying campaign had been ended in 2015 over health and environmental concerns, but faced with an increasing amount of coca under cultivation, the government is now resorting once more to the herbicide. Republic of Georgia Police Raid Party Office, Seize Pot Plants. 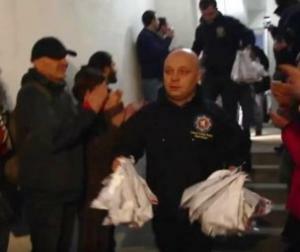 Georgian police raided the office of the Girchi Party Wednesday, seizing 84 marijuana seedlings that had been planted New Year's Day in a bid to gain publicity for drug decriminalization. Police had threatened party activists with up to 12 years in prison for drug cultivation, but so far have only seized the plants. "This is the price of the action, that something like this would have consequences. Let's see what level this absurdity will reach. I worry about the plants. I am not sure if they will take proper care on them," Iago Khvichia, a member of the party's political council said.